We don’t need more reasons to feverishly wait for the NFL offseason to end. And yet, adding to our eager anticipation is the fact that the field of contenders for Super Bowl 50 just got more intense as there are now three teams tied as favorites to win it all. The two powerhouse clubs from the NFC remain on top, while the oddsmakers are also touting an AFC team, and it’s not the defending Super Bowl Champs in the New England Patriots. The Seattle Seahawks are aiming for their third consecutive trip to the Super Bowl, and are at +600 to take home the Lombardi Trophy for the second time in three years. So, what’s new with Seattle? Well, signing Jimmy Graham from the New Orleans Saints is what’s new, as the prolific tight end figures to give Russell Wilson and the Seattle offense a huge boost in the passing game. Oh, and didn’t we mention that their vaunted defensive core is still intact to shut down any and all of their opponents? But if there’s one other team in the NFC that could give Seattle a run for its money, it would be none other than the Green Bay Packers. Reigning league MVP Aaron Rodgers must be itching to avenge his team’s gut-wrenching overtime loss at the hands of the Seahawks from last year’s NFC Conference Championship game. The Packers are at +600 to win the Super Bowl with their revamped defense, and by retaining most of their potent offensive weapons to complement Rodgers on the attack. While the “Deflategate” scandal and Tom Brady’s four-game suspension from its aftermatch punctured the New England Patriots’ chances at a repeat down to +850, the Indianapolis Colts are now touted to represent the AFC in the Super Bowl with their +600 odds to win. Veteran offseason additions in Frank Gore and Andre Johnson vaulted the Colts’chances significantly. 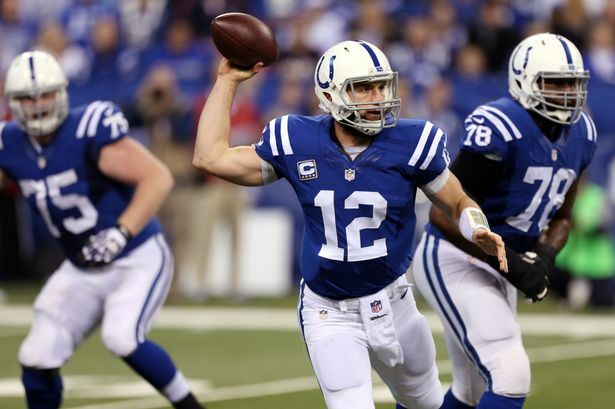 And of course, there’s the ever improving playmaking skills of Andrew Luck. Indianapolis also plays in arguably the weakest division in the AFC, while the Patriots saw their own division rivals make significant upgrades in hopes of ending New England’s dominance over the AFC East.